Operator Appointment Notifications in 1-Touch Marketing - Appointments & Online Bookings. Would you like your Simple Inked to automatically notify your operators via SMS or Email when they have a new appointment (regular and online), or even when their existing appointments are updated or cancelled? Have a read of the following article to ensure that your operators are always up to date with their schedule, and are aware of all appointments updates as they occur. Enabling your Operator Appointment Notifications in 1-Touch Marketing. To turn this functionality on, head over to your SMS & Email tab in Admin. In your 1-Touch Marketingsection, you'll see the Operator Appointment Notifications. Edit the Operator Appointment Notifications, and check out the settings on the right side panel. SMS Enabled: Tick this if you would like your operators to be notified via SMS. Email Enabled: Tick this if you would like your operators to be notified via Email. Note: You can tick both options, and operators will receive an SMS and an Email. 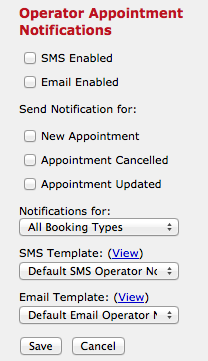 You can choose which appointment changes warrant an SMS / Email notification for your operators. 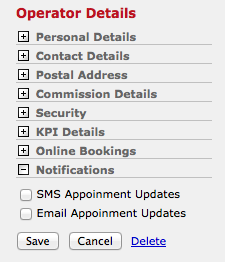 New Appointment: This will send an SMS / Email to notify your operators of all new appointments made in their column. Appointment Cancelled: This will send an SMS / Email to notify your operators when an appointment is deleted from their column. Appointment Updated: This will send an SMS / Email to notify your operators when an appointment in their column is rescheduled. The next setting is to choose what the notifications are for; the Appointments page in your Simple Inked account, or for your Online Bookings - or of course you can select All Booking Types to include both. Lastly, you can choose the SMS / Email Template which is to be used for these notifications. If you would like to customise the templates, please refer to the Creating & Editing SMS Email Templates article for the steps. After you've created the templates, selected them from the drop down menus here. When you have filled out all of the settings, click Save. Enabling your Operators for Operator Appointment Notifications. In order for your operators to receive these notifications, you need to enable each operator. Go to the Operators tab in Admin and Edit an operator. On the right side panel expand (+) the Notificationssection in the Operator Details. If you would like this operator to only receive notifications via SMS tick SMS Appointment Updates. If you only want the operator to receive notifications via email, tick Email Appointment Notifications. If you want them to receive both an SMS and an Email, tick both settings. Click Save when you're done. That's all there is to it. Your operators won't miss a beat again.